Sharpen your culinary skills in a cooking class at Art & Soul! Our warm & inviting kitchen is the perfect place to take you on a culinary adventure! All of our cooking classes are hands-on so participants receive experience they can take home with them (along with all the recipes, of course!). The talented and experience culinary team offers hands-on cooking classes, dinner parties, and kid's classes designed to educate, never intimidate. Experience the creative side of cooking by learning the basics or challenging yourself with one of our specialty classes. All of our cooking classes are open to ages 13 and up, with the exception of wine/alcohol themed classes (21 and over for these, please!). Kids 12 and under are welcome to register with a paying adult. Explore your creative side in one of Art & Soul's art classes! You don't have to be an artist or even know how to hold paintbrush--our classes are meant to be fun and EASY! Our art instructors have a passion to share what they do with others, using simple teaching methods and an inspiring atmosphere. What sets us apart? Art classes at Art & Soul are kept small so participants get individual attention, but still can have fun in the process. You will be sure to leave with something you're proud to display! And if you are 21 or over, you can enjoy a glass of wine! These outings are a perfect date night, girl's night, or just something a little different to do! Celebrating a milestone with family, friends or business associates should be special! Art & Soul's private parties are perfect for any type of gathering! 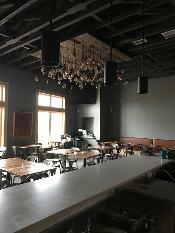 ​Art & Soul’s events are unique, entertaining and a great option for birthdays, bachelorette parties, engagement parties, bridal and baby showers, holiday parties, anniversaries, graduation parties, couples night out, and family gatherings. Our space is creative and inviting, perfect for events of all kinds! Our scratch kitchen guarantees freshness and delightful flavors! Stop in for lunch Monday through Saturday from 11:00am-2:00pm and catch our specials on Fridays and Saturdays. We have happy hour during lunch and from 4-6 Wednesday - Saturday. Grab a glass of specialty wine or a local beer and relax! We also offer catering options. Check out what makes our store so special - if you're looking for the perfect gift, the best of the best kitchen tools, a fabulous wine, or one of a kind art work to hang in your home, you'll find what you're looking for and more!